The TrikeGo characteristics make it unique among other cargo bikes. Our cargo bike was studied so that it could offer the greatest stability and smoothness. This is why we planned a steering system that could make it have the same inclination as a normal bike when driving. 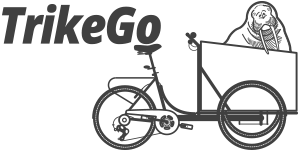 Our TrikeGo is a cargo bike entirely produced and assembled in Italy, built with extremely good material, on which high class mechanisms are mounted. For its production we avail ourselves of local craftsmen : welding, assembling of mechanisms and technical supervision are cared for in every detail, to guarantee strength and life. TrikeGo is assembled at BiART.Italia, a family business with a name for itself in the production of handicraft bikes. Each detail of every TrikeGo is tested by the specialized workers, who took care of its assembling, up to the final inspection. We are proud of our cargobike! TrikeGo is a fellow traveler that offers a different outlook of the world. Buying an Italian cargo bike means to strengthen local work , to give work to local craftsmen who have enthusiastically joined the TrikeGo project , each of them contributing his own experience to the carrying out of the bike. TrikeGo is a cargo bike that combines structural and mechanical strength with an easy and economical maintenance. Its components can be find at any cycle shop and easily replaced.